A record price of $182,000 was spent on this Gatsby at Bonham's. This has been a tough year for the book trade. Our own figures, gathered from auction results around the world, indicate a drop of 30%-plus in prices since the peak a little over a year ago. Not that this is specifically related to books. One look at your mutual funds or 401k portfolio will tell you this represents the state of the economy more than the state of books. Just try to sell your house! So, it is good to see an occasional bright spot. Interestingly, this one comes from a particularly maligned field - 20th century fiction. In the midst of one of the toughest periods, and in a challenging field of collecting, suddenly we see record-breaking prices. 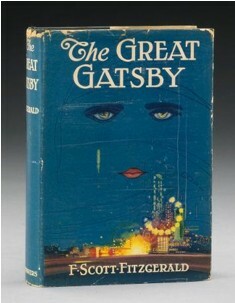 A copy of the first edition, first issue of The Great Gatsby went up for sale at Bonham's in New York on June 10. This copy of the 1925 classic came with the rare dust jacket. Bonham's noted that some people have called the Gatsby dust jacket "the most expensive piece of 20th century printed paper in book collecting." We cannot vouch for that claim, but Bonham's placed a healthy estimate of $80,000 - $120,000 on the book, only to see bids go flying past the estimate. It came in at $182,000. Bonham's reported that this was the highest auction price ever paid for any copy of the highly collectible Gatsby. Our own research indicates the previous high was $153,600, paid at Sotheby's for an inscribed copy in 2004. Meanwhile, Reuters reported that a record amount was spent with an English bookseller at a fair in London recently. We cannot vouch for private transactions since, unlike auctions, they are conducted in ... private. However, according to Reuters, an unnamed collector spent 275,000 pounds ($442,900) for a signed first edition of James Joyce's Ulysses, which Reuters described as "the highest price ever paid for a 20th-century first edition." The seller was Pom Harrington of Peter Harrington Antiquarian Bookseller of London. There were some notable items of Americana to go up for sale last month as well. A hugely important piece in the field, one of only three known copies of the first of Benjamin Franklin's Poor Richard almanacs, published in 1733, sold at Sotheby's for $566,500. This one had a high estimate of $150,000. Sotheby's also offered a copy of Catlin's North American Indian Portfolio at the Graham Arader Sale. It sold for $230,000. The first volume of the first edition of The Federalist, by Alexander Hamilton, James Madison, and John Jay, published in 1788, and essential to the adoption of America's Constitution, sold for $95,600 at Heritage Auction Galleries. Not bad for an orphan volume, and roughly ten times the estimate. Meanwhile, the sale of the Paul and Marianne Gourary Collection of Illustrated Fete Books at Christie's brought in almost $3.5 million in sales. A Schembart illustrated manuscript led the way at $158,500. The top prices paid for many of these exceptional items in a very down market is illustrative of one of the most basic rules of collecting. The very best material, in terms of importance and condition, almost always outperforms the market. Today offers no exception. While most collectors may not be able to buy a first edition Gatsby or Ulysses, a book collector who is also an investor would be well advised to look for material that is likely to gain in importance and collectibility, and buy a copy that is in the best condition obtainable.